Hopefully this isn't your last knife but until the end it is highly recommended! 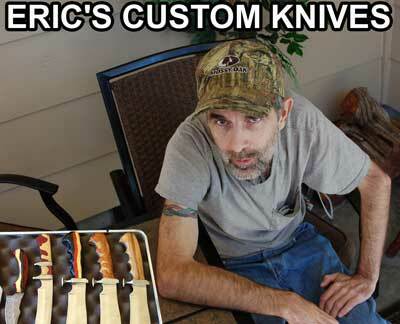 Eric's Custom Knives are constructed of the highest quality steel we can find. Typically a 440c high carbon and stainless steel that takes both extreme hot and extreme cold temperatures without cracking. Our Oregon Custom Blades hold an edge well enough to withstand the most successful Elk Hunting Trips! 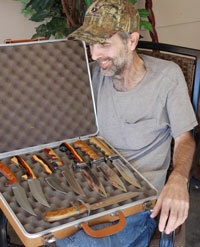 Eric's Custom Knife blades are hardened to RC 57-58 blad hardness. Extremely Sharp! And complete with a quality satin finish. Recommended by "The Four Horsemen," it's a great design for the sportsman and the zombie hunter alike! Clip point up swept blade with a false upper edge. Non-reflective satin finish hardened to RC57-58. 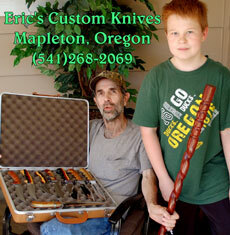 Eric and Vince Hayes are custom knife builders and custom walking stick Makers. We had began building walking sticks because I've had M.S. (Multiple Scerosis) for 21 years now and my balance has gotten worse. Since Dad needed (I just wanted one!) a walking stick, not just any, I wanted one that was a reflection of me (twisted and bitter). After Eric and I had made the first custom walking stick, I found that there was a lot of people that needed one, or at least could sure use one.. In the first four years of Eric & Me getting creative with our walking stick designs, in manufacture and composition, didn't sell one stick for money. Even thou it would take us two to four months to make just one. The folks that have one of Eric's and My walking sticks are usually older, and like me disabled. It gives us great pleasure to think our projects are being used and appreciated. We would make anyone a custom walking stick stick just to see the look in there eyes. It always seems to be worth it. At least for us. So far we have recieved great appreciation and thanks, We've recieved some great pies and cakes delivered on my porch. It's a great feeling for Eric and Me to know we've been able to help so many with something we enjoy doing together. THEN, we started to make custom knives together. I would buy wood to make the sticks and there always seemed to be some extra specialty wood that was too small to make a stick out of and I was starting to get quite a pile of good specialty wood. Being a hunter and fishermen all my life, I new what I liked in a knife. Eric loves to go fishing and is just getting old enough to start hunting. 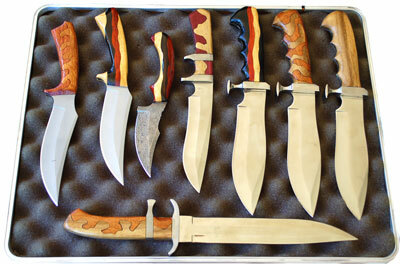 We decided to start using our woodworking skills on custom knifes and we've had so much fun together. We make one or two Custom Knives a month and just decided to start selling a few. - I might even have a walking stick once in a while. 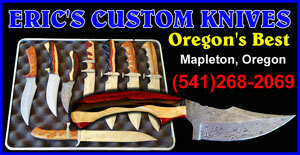 We'll try to give a good price on our custom knifes, just enough so's we can fund our new hobby.